A Wiggle Powered Ride on Toy. Looking for a unique Christmas present, or a birthday gift they will enjoy for years? Then look no further. This incredibly innovative and futuristic looking ride on toy is propelled by inertia, gravity, friction and kid power. There are no batteries, pedals or pushing necessary. Just twist or wiggle the steering wheel back and forth to move the PlasmaCar forward. It is so much fun that your kids won't even realize how much exercise they are getting. It is a great physical activity that will keep your kids happy and healthy. The PlasmaCar operates silently as it glides across the ground. All that you hear are the wheels rolling and children giggling. It's so easy to operate too. All you need is a driver and a smooth, flat surface for endless hours of fun. It is so sturdy, it will support up to 220 lbs. on smooth surfaces (or 120 lbs. on uneven terrain). This means mom, dad and grandma can all ride it too! 5-minute assembly required. 5 colors to choose from. To propel the PlasmaCar, all you have to do is rotate the steering wheel continuously from left to right. This will move the car forward at a speed of up to 6 miles per hour. The faster you wiggle the wheel, the faster you will go. It also works in reverse. To roll backwards, rotate the wheel around to the opposite position. The larger front wheels should be in the front for reverse and in the back for forwards. To stop the Plasma Car,simply stop rotating the steering wheel and, when the car slows, put your feet on the ground to bring it to a full stop. Kids feel the need for speed and this toy will give them exactly what they need!. Superior materials and manufacturing ensure that this great toy will be both sturdy and safe. It is made from high quality ABS plastics for a rugged and durable body. Sleek and aerodynamic styling give the PlasmaCar a look that kids love. It looks like a race car and rides like one too. This is like no other vehicle you've ever seen! Since there is no internal propulsion, kids learn to use motion and physics to move the car along. The motion with which you need to move the steering column is similar to moves made on a skateboard inline skates using alternating pressure. Pair with the Chalk City Road Maker for endless amounts of outdoor fun. Order Yours Today! Dimensions (l x w x h) 31" x 14" x 16"
PlasmaCar - The most fun ride on toy for kids. No batteries, no pedals and no pushing. Just plain fun! 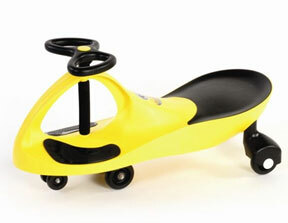 The PlasmaCar is a favorite of boys and girls alike. Just turn the wheel to zoom away! Order Yours Today! They do operate in a similar way, so this action could result in faster operation and increased longevity.